Pole Shifting. Did Earth Lose its Balance Half a Billion Years Ago? Charles Hapgood, The Path of the Pole. "In a polar region there is a continual deposition of ice, which is not symmetrically distributed about the pole. The earth's rotation acts on these asymmetrically deposited masses [of ice], and produces centrifugal momentum that is transmitted to the rigid crust of the earth. The constantly increasing centrifugal momentum produced in this way will, when it has reached a certain point, produce a movement of the earth's crust over the rest of the earth's body, and this will displace the polar regions toward the equator." Edgar Cayce is America's best documented psychic. Before he died in 1945, he gave over 14,000 "readings," dealing with clairvoyant analyses of physical ailments and cures for people, with the former lives of individuals (reincarnation was assumed to be true for all), and a variety of spiritual and other subjects. A small number of readings describe a pole shift, and historically-unprecedented Earth changes to occur before the end of next year. Almost no research has been done on the sources of information coming through Cayce for specific readings of interest. Gina Cerminara (trained in general semantics and now deceased) made a survey of Cayce's sources, as explained in the readings themselves. She concluded that he had six sources: (1) the subconscious mind of Cayce himself; (2) the subconscious minds of other individuals in the Earth plane, (3) the subconscious minds of disincarnate entities in the spirit plane, (4) the soul minds of higher masters, (5) the akashic records, and (6) the Universal cosmic consciousness. Many familiar with Cayce's readings assume there will be no pole shift because, they say, none of Cayce's historically-unprecedented Earth change predictions have been fulfilled. Before providing information that contradicts this position, let's review the three readings that together say - or imply - that a shifting of the poles will occur sometime before the close of 2001. These readings predict a sequence of geophysical events, beginning in 1958 to 1998, that culminate in upheavals in Earth's polar areas, increased volcanic eruptions in the torrid areas, and then, a shifting of the poles in 2000-2001. As indicated, one knows next to nothing about Cayce's sources for these readings, but here is a short list of events that fit with Cayce's 1958-1998 predictions. The earth is home to two North Poles located in the Arctic region - a geographic North Pole and a magnetic North Pole. The northernmost point on the earth's surface is the geographic North Pole, also known as true north. It's located at 90° North latitude and all lines of longitude converge at the pole. The earth's axis connects the north and south poles, as its the line around which the earth rotates. The North Pole is about 450 miles (725 km) north of Greenland in the middle of the Arctic Ocean - the sea there has a depth of 13,410 feet (4087 meters). Most of the time, sea ice covers the North Pole but recently, water has been sighted at the exact location of the pole. If you're standing at the North Pole, all points are south of you (east and west have no bearing). Since the earth's rotation takes place once every 24 hours, if you're at the North Pole your speed of rotation is quite slow at almost no speed at all, compared to the speed at the equator at about 1,038 miles per hour. The lines of longitude that establish our time zones are so close at the North Pole, the Arctic region uses UTC (Coordinated Universal Time) when local time is necessary at the North Pole. The North Pole experiences six months of daylight and six months of darkness. Located more than 1000 miles (1600 kilometers) south of the geographic North Pole lies the magnetic North Pole at 78°18' North and 104° West, southwest of Nunavut, Canada's Ellef Ringnes Island. The earth's magnetic pole is the focus of the planet's magnetic field and is the point that traditional magnetic compasses point toward. Compasses are also subject to magnetic declination which is a result of the earth's varied magnetic field. Each year, the magnetic North Pole and the magnetic field shift, requiring those using magnetic compasses for navigation to be keenly aware of the difference between magnetic north and true north. The magnetic pole was first determined in 1831, hundreds of miles from its present location. The National Geomagnetic Program of Geological Survey of Canada monitors the movement of the north magnetic pole and most recently determined its precise location in 1994. They've determined that the pole is moving at approximately 9 miles (15 kilometers) each year. The north magnetic pole moves on a daily basis, too. Every day, there's an elliptical movement of the magnetic pole about 50 miles (80 kilometers) from its average center point. PASADENA--Researchers at the California Institute of Technology think they have solved part of the mystery of the "evolutionary big bang" that occurred half a billion years ago. At that time, life on Earth underwent a profound diversification that saw the first appearance in the fossil record of virtually all animal phyla living today. With relative evolutionary rates of more than 20 times normal, nothing like it has occurred since. In a paper published in the July 25th issue of Science, the Caltech group reports that this evolutionary burst coincides with another apparently unique event in earth history--a 90-degree change in the direction of Earth's spin axis relative to the continents. Dr. Joseph Kirschvink, a geologist at Caltech and lead author of the study, speculates that a major reorganization of tectonic plates during latest Precambrian time changed the balance of mass within the Earth, triggering the reorientation. Thus, the regions that were previously at the north and south poles were relocated to the equator, and two antipodal points near the equator became the new poles. "Life diversified like crazy about half a billion years ago," says Kirschvink, "and nobody really knows why. It began about 530 million years ago, and was over about 15 million years later. It is one of the outstanding mysteries of the biosphere. "The geophysical evidence that we've collected from rocks deposited before, during, and after this event demonstrate that all of the major continents experienced a burst of motion during the same interval of time." David Evans, a co-author on the paper and graduate student at Caltech, notes that it is very difficult to make large continents travel at speeds exceeding several feet per year; typical rates today are only a few inches per year. "Earth has followed a 'plate-tectonic speed limit' for the past 200 million years or so, with nothing approaching the rates needed for this early Cambrian reorganization." Evans said. "Some other tectonic process must have been operating that would not require the continents to slide so rapidly over the upper part of Earth's mantle." In fact, geophysicists have known for over half a century that the solid, elastic part of a planet can move rapidly with respect to its spin axis through a process known as "true polar wander." True polar wander, Kirschvink explains, is not the same as the more familiar plate motion that is responsible for earthquakes and volcanism. While the latter is driven by heat convection in Earth's mantle, true polar wander is caused by an imbalance in the mass distribution of the planet itself, which the laws of physics force to equalize in comparatively rapid time scales. An analogy of the effect can be seen by cementing lead weights at the antipodal (or opposite) ends of a basketball. If the ball is then set on a slick floor and spun with the weights along the equator, the ball will spin in a manner as one would normally expect, with the weights remaining on the equator. If the ball is spun on one of the lead weights, however, the axis of rotation will tend to migrate until the weights are again on the ball's equator. In this configuration, the spinning ball has aligned its maximum moment of inertia with the spin axis, as required by the laws of physics. As for astronomical evidence that such a phenomenon can occur, the authors point to Mars. Along the equator of the Red Planet is a gigantic volcano known as Tharsis, which is known to be the largest gravity anomaly in the solar system. Tharsis could have formed on the equator, but more likely formed elsewhere on the planet and then migrated to the equator via true polar wander because of rotational torques on its excess mass. Something similar must have happened to Earth, says Kirschvink. At about 550 million years ago, 20 million years before the evolutionary burst, one or more major subduction zones in the ancient oceans closed down during the final stages of assembly of the supercontinent of Gondwanaland, leading to a major reorganization of plate tectonic boundaries. Geophysicists have known for many years that this type of reorganization could, in theory, yield a sharp burst of true polar wander. In particular, if Earth were slightly "football shaped," with a major and stable mass anomaly on the equator and a more equal distribution of mass elsewhere, only slight changes of the smaller masses would be needed to produce large motions. A burst of motion up to 90 degrees in magnitude could even be generated if the maximum moment of inertia (about which the planet spins) became less than the intermediate moment (which is always on the equator). The massive plate motions observed by the Kirschvink group fit the predictions of this "inertial interchange" event rather closely. Over the 15 million year duration of this true polar wander event, the existing life forms would be forced to cope with rapidly changing climatic conditions as tropical lands slid up to the cold polar regions, and cold lands became warm. "Ocean circulation patterns are sensitive to even slight changes in the location of the continents," says co-author Robert Ripperdan, a geochemist at the University of Puerto Rico and a Caltech alumnus. "A progressive shift of this magnitude could cause oceanic circulation patterns to become rather unpredictable, jumping from one semi-stable configuration to another on a million-year time scale. "Imagine the havoc which would result in Europe if the Gulf Stream were to disappear suddenly. These jumps offer an explanation for yet another unique mystery of the Cambrian explosion, which is a series of nearly a dozen large swings in the marine record of carbon isotopes. "Repeated changes in global oceanic circulation patterns should ventilate organic carbon buried in the deep oceans, producing these carbon wiggles," Ripperdan says. "We used to think that they were somehow due to repeated expansion and contraction of the entire biosphere, but no one could think of a mechanism to do that. All of the evidence suddenly makes sense with this true polar wander model." But what caused the evolutionary burst? Kirschvink notes that these global shifts in oceanic circulation will also act to disrupt regional ecosystems, breaking them down into smaller, more isolated communities. "Evolutionary innovations are much more likely to survive in a small, inbreeding population, rather than in large, freely interbreeding groups," he notes. "And the carbon cycles are telling us that major changes in ocean circulation happened about every million years or so. That is certainly enough time for natural selection to weed through the fragments left by the last disruption, and to form new, regional-scale ecosystems. "Then, Wham! They're hit again and the process repeats itself. That is a great script for increasing diversity, particularly as it seems to have happened shortly after the evolution of major gene systems which regulate animal development." The end result was that evolution proceeded nearly 20 times faster than its normal rate, and the life of the planet diversified into many groups still living today. Kirschvink and his collaborators base their conclusions on data collected from 20 years of work on numerous well-exposed sections of the Precambrian-Cambrian and Cambrian-Ordovician eras. By studying the weak fossil magnetism (paleomagnetism) left in many rocks as they form using ultrasensitive superconducting magnetometers, they can recover the direction of the ancient geomagnetic field. This provides information concerning the direction of ancient north, for the same reason that a small hand-held magnetic compass can be used to find the approximate north direction today. This remanent magnetism can also provide an estimate of the ancient latitude in which the sediments were deposited, as the inclination or dip of the magnetic field changes smoothly with latitude--it points vertically at the poles and is horizontal (tangent to the earth's surface) on the equator. Therefore, the fact that magnetic materials are found pointing in other directions is evidence that the ground itself has moved in relation to Earth's magnetic North, which is locked over time to the spin axis. "This hypothesis relating abrupt changes in polar wander to evolutionary innovations could be tested in many ways," notes Kirschvink, "as there are some interesting events in the paleontological record during the following 200 million years which might have been triggered by similar processes. "There's lots of work to do." "In 1958 Charles Hapgood suggested that the Earth's crust had undergone repeated displacements and that the geological concepts of continental drift and sea-floor spreading owed their secondary livelihoods to the primary nature of crustal shift. According to Hapgood, crustal shift was made possible by a layer of liquid rock situated about 100 miles beneath the surface of the planet. A pole shift would thus displace the Earth's crust in around the inner mantle, resulting in crustal rock's being exposed to magnetic fields of a different direction." "An earth crust displacement, as the words suggest, is a movement of the ENTIRE outer shell of the earth over its inner layers. If you remove the peel from an orange and then reattach it to the fruit you can visualize the possibility of the peel moving over the inner layers. The earth's crust, according to Charles Hapgood, can similarly change its position over the inner layers. When it does the globe experiences climatic change. The climatic zones (polar, temperate and tropical) remain the same because the sun still shines on the earth from the same angle in the sky. From the perspective of people on the earth at the time, it appears as the sky is falling. In reality it is the earth's crust shifting to another location. Some land moves towards the tropics. Others shift, with the same movement, towards the poles. Yet others may escape such great changes in latitude. The consequence of such a movement of the entire outer shell of the earth is catastrophic. Throughout the world massive earthquakes shake the land and enormous tidal waves crash into and over the continental shelf. As the old ice caps leave the polar zones they melt, raising the ocean level higher and higher. Everywhere, and by whatever means, people seek higher ground to avoid an ocean in upheaval." Vavilov found a direct correlation between agricultural origins and lands more than 4,920 feet above sea level. 'Let us assume, as a working hypothesis, that under the impact of a force or the influence of an agent - and the Earth does not travel in an empty universe - the axis of the earth shifted or tilted. At that moment an earthquake would make the globe shudder. Air and water would continue to move through inertia; hurricanes would sweep the Earth, and the seas would rush over continents, carrying gravel and sand and marine animals, and casting them onto land. Heat would be developed, rocks would melt, volcanoes would erupt, lava would flow from fissures in the ruptured ground and cover vast areas. Mountains would spring up from the plains and would climb and travel upon the shoulders of other mountains, causing faults and rifts. Lakes would be tilted and emptied, rivers would change their beds; large land areas and all their inhabitants would slip under the sea. Forests would burn, and the hurricanes and wild seas would wrest them from the ground on which they grew and pile them, branch and root, in heaps. Seas would turn into deserts, their waters rolling away. What caused tropical forests to grow in polar regions? What caused volcanic activity on a great scale in the past and lava flows on land and in the ocean beds? What caused earthquakes to be so numerous and violent in the past? Puzzlement, despair, and frustration are the only answers to each and every one of these phenomena. The theories of uniformity (or gradualism) and evolution maintain that the geological record bears witness that from time immemorial, even from the time this planet began it's existence only minute changes - caused by the wind blowing on rocks, the sand grains swimming to the sea - accumulated into vast changes. These causes however, are inadequate to explain the great revolutions in nature, and they evoke the expressions of futility on the part of the specialists, each in his field. ... The evidence is overwhelming that the great global catastrophes were either accompanied or caused by shifting of the terrestrial axis or by a disturbance in the diurnal and annual motions of the Earth ... The state of lavas with reversed magnetization, hundreds of times more intensive than the inverted terrestrial magnetic field could impart, reveals the nature of the forces that were in action ... Many world-wide phenomena, for each of which the cause is vainly sought, are explained by a single cause: the sudden changes in climate, transgression of the sea, vast volcanic and seismic activities, formation of ice cover, pluvial crises, emergence of mountains and their dislocation, rising and subsidence of coasts, tilting of lakes, sedimentation, fossilization, the provenance of tropical animals and plants in polar regions, conglomerates of fossil animals of various latitudes and habitats, the extinction of species and genera, the appearance of new species, the reversal of the Earth's magnetic field, and a score of other world-wide phenomena. Look into any one of the above fields and you will begin to see the same pattern Velikovsky, Hapgood, Einstein and hundreds of other independent geologists, paleontologists and archeologists have recognized in the Earth's past. A pattern of repeated, catastrophic change thought to be brought about by crustal displacements activated by one or more outside agents - such as passing comets or fluctuations in the sun's own magnetic field - appears to have been with humanity and its civilizations from the very dawn of mankind. And coral has been found in Newfoundland, ferns, fossils, coal and fossilized tree-stumps have been found in Antarctica, water lilies and fossilized palm leaves ten and twelve feet long have been found in Spitzbergen, there is evidence that the swamp cypress flourished within 500 miles of the North Pole in the Miocene epoch, and more. The evidence is overwhelming that the Poles have not covered the same parts of the planet for the entire extent of our geological history. "If the horror of an earth-crust displacement were to be visited upon today's interdependent world the progress of thousands of years of civilization would be torn away from our planet like a fine cobweb. Those who live near high mountains might escape the global tidal waves, but they would be forced to leave behind, in the lowlands, the slowly constructed fruits of civilization. Only amongst the merchant marine and navies of the world might some evidence of civilization remain. The rusting hulls of ships and submarines would eventually perish but the valuable maps that are housed in them would be saved by survivors, perhaps for hundreds, even thousands of years. Until once again mankind could use them to sail the World Ocean in search of lost lands ..."
That something such as this could have happened to the earth seems, in our forward-looking culture of progress, somehow unbelievable. We are not taught such concepts at school nor are we brought up to think in this way. Suggesting that it could happen in the future can earn everything from the epithet of 'prophet of doom' to outright academic scorn. Nevertheless, look into the holy works and records of the ancient civilizations and you will find corroboration from what remains of the 'media' of their time, their mythology, legends and folklore. Cataclysmic events on a global scale did strike the civilizations of the ancients, and many recorded it in the clearest and most intelligible ways they were capable of at the time. The accounts survive to this day as myths of catastrophes. The Path of the Pole by Charles H. Hapgood is now available in paperback, as is Maps of the Ancient Sea Kings. Charles H. Hapgood was a history professor who began, at the prompting of some students, to look into the search for the lost continent of Atlantis. That lead him to the ideas of Hugh Achincloss Brown: that the entire earth could be made to be repositioned at a radically new angle on its axis of rotation. Hapgood realized that the entire planet did not have to be repositioned around its axis. Only the outer crust need move, just as the loosely peeled skin of an orange could be slid around the unmoved inner slices. This line of thinking was published in Earth's Shifting Crust (1958), in collaboration with James H. Campbell, a mathematician-engineer. Hapgood ultimately revised key parts of his thinking because his calculations convinced him that the mass of the ice cap on Antartica could not destabilize the earth's rotation. "Polar wandering is based on the idea that the outer shell of the earth shifts about from time to time, moving some continents toward and other continents away from the poles. Continental drift is based on the idea that the continents move individually...A few writers have suggested that perhaps continental drift causes polar wandering. This book advances the notion that polar wandering is primary and causes the displacement of continents....This book will present evidence that the last shift of the earth's crust (the lithosphere) took place in recent time, at the close of the last ice age, and that it was the cause of the improvement in climate." Hapgood then goes on to mention to two areas where he finds much of his evidence, in data derived from studies of geomagnetism and from carbon 14 dating. Although he argued that such global disruptions happened repeatedly, Hapgood by then was rejecting the idea that such disruptions could happen quickly. Based primarily on that technical data, he argued that each shift took approximately five thousand years, followed by 20 to 30 thousand year periods with no polar movements. Also, in his calculations, the area of movement never covered more than 40 degrees. The presence of a truly liquid layer between the core and the outer crust would allow such slippage, moderated by inertial forces. the mammoth died a sudden death. Its body was deep-frozen instantly. When the mammoth was found in the Siberian permafrost region thousands of years later, its body tissue was so well preserved that the sledge dogs very eagerly fed on it. 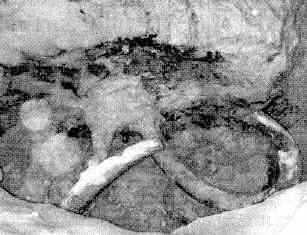 In fact, the mammoth's body had not decomposed at all as it was subjected to freezing conditions in it's solitary grave. There are many stories of mammoths roaming the glacial planes of Europe and Siberia. I always wandered where these huge animals found enough food to live on in a cold climate where but little vegetation could exist. The Siberian mammoth finally gave an answer to this baffling question that made sense: those planes were not glacial, they were subtropical and in other more distant locations there was steppe vegetation as proven by the most recent findings. This mammoth had plants in its stomach and even in its mouth undigested and very well preserved by the subzero temperatures. All these were plants as found in a subtropical climate. - The plants made this mammoth a scientific sensation. For if the mammoth lived in a subtropical climate, how come it was deep-frozen so quickly as not to decompose even a little? The author lives in a subtropical climate. From experience one knows that everything decomposes very fast under the impact of heat and the sun's intense radiation. No dead organic matter can defy these forces. It cannot be assumed that this dead mammoth would not have reacted to these factors of a subtropical climate. Had it been exposed to heat only for one day, the signs of beginning decomposition would have been clearly visible. But there were none! The only conclusion possible at all is: the climate must have changed from subtropical to arctic in a very short time. It is this very point of the mammoth's story, which makes it an utterly controversial one. Cataclysmic evolutionists made this mammoth one of their main arguments in favor of their theories. All the others preferred to overlook it or tried to explain this obvious conclusion away. And yet, this mammoth proves very clearly: there must exist somehow the possibility for the climate to change practically from one moment to the next and very drastically so. For in this case it was not a change of several degrees of latitude. This was a dramatic change, which by its very nature shows it shifted the climatic zones over at least a quarter of the globe. This, in turn, means that the poles' locations had changed, too. It cannot have been a gradual change as some cataclysmic evolutionists suggest; it must have been a change, which took place in an instant. This point ads further spice to the mammoth's story, for it is precisely this point which upsets many orthodox scientific theories. A very important question has to be answered: which forces were able to cause such a dramatic change and were able to do so many times in our planet's history? For if the poles can indeed jump, then the signs of glacial activity all over the globe prove that the poles have jumped many times. This fact also shows it is nonsensical to assume that a. passing cosmic dust cloud was responsible for a cooling of the planet at a specific time thus causing Glaciation. Studies have shown that when on one side of the globe there was extensive Glaciation, then on the opposite side the same was the case. In between there were climates as they normally do occur in between poles. Consequently, the so-called ice times are not exceptional conditions of the entire globe; they just show where the arctic and Antarctic regions were located at specific times of the planet's history. Europe's and North Americas ice times just tell us that one of the poles was located somewhere in the area, which then was covered by ice. It is not this articles purpose to repeat the arguments for a cataclysmic evolution. There are enough publications dealing with this topic and some are good enough to prove the point. Many have discovered the evidence and presented it to the public. But the big question still unanswered is the evidence of what? Which forces can cause jumps of the poles in less than a day? Which principles are at work? NASA's confirmed the notion that the universe is a gigantic electromagnetic structure with the discovery that the gas planets' systems of rings and moons are arranged along the lines of their electromagnetic fields. Cosmically and physically speaking, electromagnetism determines the location of matter and, therefore, the location of the poles, as well. Hence, changes in a planets electromagnetic structure are responsible when the poles jump. Scientists at Leipzig University in Eastern Germany developed the model that this planet is functioning like a gigantic dynamo. The inner core with its content of heavy metals is the anchor, the liquid magma works like a clutch and the lighter ores in the planets crust act as the windings. The heavy core moves at a lesser speed than the lighter crust of the planet. Metals and ores have magnetic properties. As their field lines intersect, mechanical energy is converted into electric energy; the planet is charged up electromagnetically! Thus, the planet builds up its own electromagnetic field. But the Leipzig study has more to it; it proves that the system is highly unstable. It is known that electromagnetic fields can change polarity. Consequently, this applies to a planetary electromagnetic field, as well. The ridges on the ocean floors bear witness to this statement. Those ridges were formed one after another during major cataclysms that struck this planet. The direction of the magnetic particles in the ridges' lava shows that these major cataclysms were accompanied by shifts of the poles' locations. A ridge builds up as lava flows out on to the ocean floor. As the lava cools down the magnetic particles in it become stabilized in their respective locations. Therefore, measurements of the directions of the magnetized particles enclosed in the ridges' lava show the location of the poles at the time when the lava cooled down. Measurements of the magnetic particles included in the various ridges' lava by the research vessel Glomar Challenger show that the direction they point to changed diametrically at least 170 times in the last 70 million years. There exist studies claiming that these dramatic exchanges of the poles' locations as shown in the lava depict only the major cataclysms and that there is compelling evidence that lesser dislocations of the poles have taken place as well in great numbers. Therefore, the question must be: why do poles change their locations at all and why so often?" Since the electromagnetic field of the planet must determine such changes, the question must further be: "what causes such dramatic changes in the planetary electromagnetic structure?" Electromagnetic forces determine the location of a planets poles and the configurations of planetary systems. To state this very clearly: the planets, the moons, the rings of matter, the asteroid belt as well as comets and meteors; everything within the solar family owes its respective cosmic location to the force of electromagnetism. If the location of a planets poles and its orbit is determined by its electromagnetic role in the concert of cosmic bodies within the Solar System, what happens when something changes drastically in its electromagnetic structure? An electromagnetic field forms according to the factors, which contribute to it. If these factors change the electromagnetic field changes accordingly. This means that adding or discharging energy changes a planet's energy potential resulting in a different electromagnetic field. Such changes in energy can diminish or strengthen the electromagnetic field locally and, thus, produce a different configuration. This field determines the location of the poles. So, when the electromagnetic field changes enough the locations of the poles change, as well. Therefore, an addition or discharge of energy and local changes in the strength of the field are the logical explanation for a shift of the location of a planet's poles. It can also be the explanation for a change of orbit! - At first sight, this seems a far out claim. But the laws of electromagnetism are the same for small and big bodies of matter. A planets orbit is determined by the same principles as an electrons orbit: by its charge, which allocates to the planet an orbit within the solar systems electromagnetic structure. Consequently, it is logical to assume that planets can indeed change orbits when their charge of energy changes sufficiently. At this point several questions arise: "how can such dramatic events take place? What can change a planets electromagnetic charge so dramatically that major changes in a planets electromagnetic structure occur? When an electron receives or releases a photon its energy potential changes and it jumps orbit. Planets receive energy from collisions with cosmic bodies like hits by a comet or a meteor. Planets release energy in volcanic eruptions. In either case if the change in a planets electromagnetic charge is significant a jump of the poles or even an orbit jump can take place. This is confirmed by reports from the distant past. The Maya and the Chinese claimed that after a major natural disaster the sun appeared smaller and the moon appeared bigger. This was possible only if the distances between the Earth and the Sun respectively the moon had changed in the course of such an event. Now the question arises: how does matter experience these energetic processes? The Siberian mammoth gives us a very short span of time for matter to follow energy's lead. The material evidence allows less than a day for a jump of the poles and movies show how it happens. I always liked those movies where the hero is in terrible danger but manages to escape. The next scene shows the same man with the damsel saved from distress. Happy end. I do not imply that Mother Nature imitates Hollywood. But let's visualize how a movie is made: it is the quick succession of pictures each of which shows a little progress as compared to the preceding one. These pictures follow so rapidly that the eye sees only the consecutive action. Unless there is a cut one cannot see the single pictures change. The cut from the scene with the hero in danger to the scene of the happy ending, however, shows that the whole movie consists of single pictures rapidly succeeding one another. To behave according to this example a material dimension has to consist of tiny particles oscillating between the phases of energy and matter so rapidly that we perceive matter as a stable material dimension. Only a cut would dramatically remind us that the stability of matter is but an illusion. We then would realize that we do not exist in a time/space continuum but in a time/space Dis-continuum! There are rumors dating back to ancient times that matter is indeed made up of tiny particles, too small to be perceived as such and following one another so rapidly that we experience matter as seemingly stable. Such concepts of the ancient Harappans in the Indus Valley and of the Greek philosophers of antiquity did not stand much of a chance to be taken seriously by Western scientists. Not even the discovery of the atom, which vindicated ancient Greek knowledge, did make much impression. So, a few learned men were genuinely surprised when the oscillation of matter between the stages of energy and matter was discovered at Heidelberg University in Germany. And yet, this finding was much more than the vindication of knowledge from ancient times. The discovery that matter oscillates between the stages of matter and energy is of absolutely highest importance. Add to this the latest theories about the quantum vacuum and we have the basis for explaining fundamental changes in the material realm, which are caused by the changes in the electromagnetic structure of a planet or of the Solar System. So let's deal with a change in the charge of a planets energy in terms of these oscillating particles that constitute matter. A planet experiences a change of its charge of energy in an energy phase. As there is no time in the realm of energy this adjustment takes place instantly and creates a new energy situation; The next matter phase is formed already with the adjusted energy situation in existence. From then on the planetary movie goes on without any cuts until the next adjustment of the planetary energy situation. But what exactly happened in the energy phase of the change and the following matter phase, which was formed with a changed electromagnetic field? An addition or a discharge of energy changes the contributing factors to a planets electromagnetic field but the changes are not uniform all over the planet. When the distribution of electromagnetic energy over the planet changes a dramatically different electromagnetic field can appear from one moment to the next. Since the adjustment to the new energy situation takes place in a single energy phase, which produces a different electromagnetic field in the next matter phase, a jump of the poles takes place in a fraction of a second as it takes no time at all. This means that just like electrons planets experience jumps of their poles and possibly even of their orbits in a split second, for energy is not subjected to the limitations of space and time. Such jumps take place during the energy phase while the entire planet is energy as it exists in the so-called quantum vacuum. In the quantum vacuum there is no time, no space and everything is interrelated. Thus, a planet experiences a jump of the poles or changes over to a new cosmic location in the energy phase, which experienced the discharge or the addition of energy. After this dramatic energy phase the planet appears in its next matter phase with a new location of its poles and possibly even in a new cosmic location, the one it belongs to because of its new electromagnetic field and new electromagnetic charge. One might ask how time fits into the picture. Time is a function of the oscillation of matter, which continuously produces tiny units of time as the matter phases appear one after another. Time is not constant. When matter oscillations appear more frequently within a specific frame of movement time passes faster, for instance, when matter moves through space at a relatively slow rate. When matter oscillations appear less frequently within a specific frame of movement because it is moving at high speed through space time passes more slowly. There is this famous example of the rapidly accelerating space ship whose crew ages more slowly than the inhabitants of the planet it left behind. - Einstein's theory of relativity provides the scientific explanation. Therefore, as polar shifts and jumps of orbits take place in the energy phase time is not a factor. To sum up: the locations of a planets poles and its orbit are determined by its electromagnetic charge. Therefore, a new very different electromagnetic field can indeed bring a different location of the poles and possibly even in a new orbit for a planet resulting in a new material dimension. A sudden shift in the poles' locations triggers major cataclysms. As the rotational plane changes the planet's matter is subjected to the forces of inertia reacting to this change. The water in oceans and lakes suddenly are moved in a different direction. The water is piled up and tremendous waves pound the coastlines. Ancient legends tell of floods, which reached hundreds of miles into continents destroying everything in their paths. The Biblical Flood and the Great Flood mentioned in the Epic of Gilgamesh for sure were caused by such an event. Legends from South America tell of a time, when ocean waves piled up more than a mile high on the western edge of the Andes. The atmosphere from one moment to the other is moved in a different direction while inertia keeps the air in its previous path. Hurricanes and tornadoes pale in comparison to the forces of winds unleashed in this scenario. The areas water can't reach are hit hard by storms, which can reach wind speeds of hundreds of miles. The sudden shift in the rotation of the planet breaks open the Earth's crust and lava flows cover wide areas. There is evidence, for instance in the Columbia plateau that such lava flows can extend and have extended over the low lands of entire continents. Continental shelves slam into ocean floors. New mountain ranges form and existing formations are forced high up. The Andes in South America are a very good example of such events, which explains sandy beaches and sea shells thousands of feet up. The same situation is found in the Alps, where seashells and fossilized sea creatures are found high up together with sandy beaches - and this in the middle of a continent. Many volcanoes erupt and spew huge amounts of dust high into the atmosphere. The climate all over the planet changes at the moment of the jump of the poles. Depending on the new location of the poles tropical lands can become deep frozen in an instant, as the deep temperature and raging ice cold winds tear the warmth out of everything in the new polar region. Other climatic zones change in an instant according to their new location. There is ample evidence of polar jumps all over the planet, as traces of Glaciation are found everywhere. The impact of these events on biological organisms is devastating. Not only is the loss of life horrendous. If a jump of the poles is accompanied by an orbital jump the temperature range of the entire planet will change. Species not suited to live in this range will be wiped out. This explains why in the course of the Earth's history sometimes up to 90 percent of the species were wiped out. - The Perm, Trias and the Jurassic extinctions are well-documented examples. But extinctions did not happen only in remote geological times. The last one wiped out the mammoths, the mastodons, saber tooth tigers and other so-called ice age animals only several thousand years ago. Fossil remains and geological evidence proof beyond the shadow of a doubt that the cycles of creation, evolution, and destruction are part of this planet's history. Life as such has survived all these cataclysms but there is no way telling which life forms will survive such a brutal scenario. There is evidence of polar jumps during the last 50,000 years after humans had appeared on the fossil record. Humans survived where other species died out. It remains to be seen how humans will fare when the next jump of the poles takes place. creature. then excavated a huge block of dirt to preserve it.